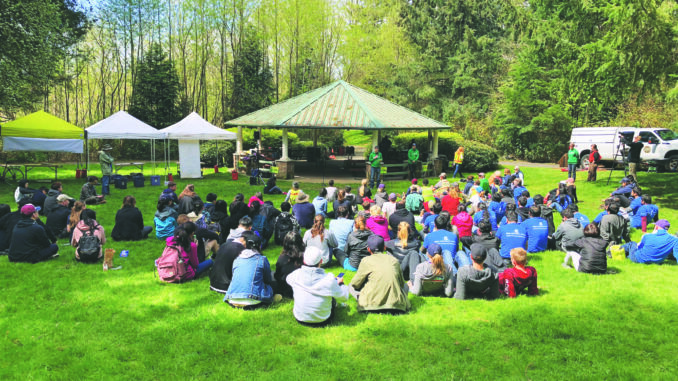 EarthCorps hosted a meaningful volunteer event at North Rose Hill Woodland Park in Kirkland on Saturday, April 22, during Earth Month. I went to a local Kirkland park as a volunteer with Bellevue College Office of International Education Global Leaders, and I have fascinating memories and thoughts to share. This volunteer project at North Rose Hill Woodland Park is part of a larger collaboration known as the Green Kirkland Partnership: an alliance between the City of Kirkland, non-profit partners, businesses and the community to restore natural areas in the city. EarthCorps envisions a world where people and nature thrive together. The EarthCorps team hosts volunteer events almost every week. Mike, one of the EarthCorp staff leading a group at the event said, “we usually work outside mostly at parks around Seattle area, and we do host volunteer events like this quite often.” Some more specific information can be found at www.earthcorps.org. The event started at 10 a.m. at the north entrance of North Rose Hill Woodland Park. Gloves, tools, water and snack bars were provided for all participants, and volunteers were not required to have any prior experience. Volunteers were separated into around 10 groups, where each group was led by an EarthCorp staff who taught participants about invasive species, strategies of using different tools, etc. I was in group seven with staff member Sara, who taught us how to use all kinds of tools to remove wild blackberry plants and English ivy, which are two types of invasive species. I worked on a field where blackberry roots were all over the place, but after an hour of working, my group managed to get rid of all the wild blackberry roots. We then mulched the field using buckets provided by EarthCorps. After that, we had a lunch break and the sponsors gave a wonderful speech. After the lunch break, my group continued mulching the field, and eventually it looked nice and even. The whole event was really satisfying, and I personally liked one of the sponsors’ quotes during the speech, “Earth month is every month.” Indeed, people need to protect our planet because this is the place we all live on. It is never too late to protect our environment. Start from now, and start from daily lives. I believe we will make a huge difference if everyone takes this responsibility. At home, throw appropriate items into trash bins with different categories, turn off lights when leaving the house and turn off water taps when not using water. These are small things we can all do together on a daily basis. However, do not think of them as small chores that don’t matter; if everyone can took action now, all these small things will generate a significant difference in society. While staying outside, do not litter. Instead, throw garbage only into appropriate places. Use paper bags instead of plastic bags while shopping and take public transportation or carpool whenever possible. These are very basic examples that can make our environment better, so please adopt these habits and make some changes. At Bellevue College, as many students and faculty may have noticed, people print large quantities of paper. Instructors usually want to print out class syllabi at the beginning of each quarter and students may need to print many papers for different subjects. However, many people I know do not usually print on both sides of a page, which leads to unnecessary waste. In my life, I encourage people to use both sides of a paper. If the instructor prefers students to use only one side of a page, they can use the other side as scratch paper after the current quarter or whenever possible. I personally use both sides of a paper whenever possible, which also saves money at the same time. Remember, we can all do many incredible things to protect the environment. Volunteer work like the event I went to helped me understand why we need to take actions to protect our planet. I strongly recommend people get involved with different kinds of environmental protection events, and I believe people will certainly learn a lot more about our environment if they do. Do not forget to let all people around you know the importance of protecting our planet so we all can make a huge difference.